A lightweight gel with deeply moisturising properties which exfoliates the outer layers of the epidermis. 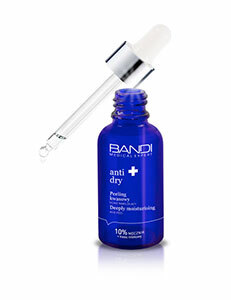 Designed for all skin types experiencing temporary and/or long-lasting dryness. It restores, smooths and maintains the correct moisture level of the skin. Dry skin deprived of its shine and moisture, regardless of age. Apply a few drops every night 2 times a week, avoiding the eye area. Rinse with water the following morning. The formula may be used independently, but for better results apply another selected product from the ANTI-DRY line after 30 minutes. You may experience temporary flaking of the epidermis (in various degrees), which is a natural effect of the formulas activity. Exposure to solar and UV radiation should be avoided when using the product. Protect the skin against UV radiation during the day. Avoid contact with eyes and mucous membranes. Due to acid content and the character of the formulas activity you may experience an increasing skin reaction on sensitive skin. Make sure to carry out a skin test before use. Apply a small amount of the formula on the skin around the jaw and observe the reaction immediately afterwards, but also after 1h, 8hrs and 24hrs. Repeat the application after 24 hours. In the case of strong irritation and skin lesions (rash, persistent erythema, itching, edema, exudation) withhold from applying the product to the whole face.